Centred on the lives of students who live in Maheshwari Devi College for Girls, this work of fiction will find resonance among many readers, even as it transcends the recent spate of feel-good campus-based books as it explores the minds of the protagonists and takes the reader through some dark alleys. In educational institutions, sheer proximity and a similarity of interests make for groups who become friends and hang out together, thereby becoming a microcosm of life at large. The world of Tara and Anjali changes with the introduction of Paromita or Paro, a newcomer who Tara takes her under her wing. Tara is working on her PhD in English Literature. She is brilliant and free-spirited girl who wants to make her own path. Her professor and guide encourages her to do so, and Tara’s thesis promises to break new ground. It is difficult to slot Tara and as she says to the hapless Anjali: "But then, it’s so boring to be usual ... you should know that!" Anjali has her heart set on going to America, and she pursues the academic route to the Promised Land with single-minded devotion — attending classes where the students only see the back of the professor, even as they try to read his squiggly handwriting. She is neat and driven, fiercely independent, not ready to fulfil her mother’s non-verbalised expectations, yet unwilling confront her. She is the only person in the group who has a boyfriend, Rajan, with whom she shares simple and uncomplicated relationship that goes back to their childhood. She keeps herself free for his 11 pm calls on Fridays. Paro, who suffers from asthma, is stylish and cultured, what, with a Calcutta background and all. She is unabashedly waiting while her parents look for a suitable boy. Her room is done up beautifully, and although a latecomer to the group, she fits in well. What do the girls do? Eat, attend classes, study, grapple with obtuse concepts, even as they take care of their basic needs ... including washing clothes, and occasionally boozing, courtesy a bottle brought by Tara’s cousin Vivek. 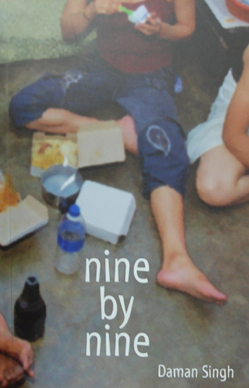 Nine by Nine is the writer’s second book. Her first was a research-based academic tome: The Last Frontier: People and Forests in Mizoram. However, this novel, written in a simple style, is an easy read. Hostel life is described in knowing detail — its hustle bustle, the intrigues and cutting comments that are a part of it and the pecking order — girls are classified according to the time they get to the mess — The Early Birds, followed by the Big Cats and the Foragers. The dialogue is realistic, and fits in well with the characters. Even though the story is woven around these main protagonists and the 9x9 room that a hostel student gets, the writer gives a realistic slice of hostel life. Paro receives scented amorous anomies letters that deteriorate to sickeningly ones with sexual overtones. The girls’ trap to catch the perpetrator fails to spring and Tara becomes convinced that her cousin Vivek is involved. Much later, the real person is revealed, but by that time, the damage has been done. The book reflects a leisurely pace of life that a stint in college can often be, and it is written in an unhurried manner. Each girl has her own rhythm and they give each other support and space, and when the occasion demands, withdraw in to their own world. Tara is a gripping character. She is a loyal friend. Her brilliance is offset by her untidiness, and as a reader gets to know her, what emerges is a reflective scholarly student pushing the envelope who seeks the approval of her icon, Dr Lalita Narain. Paro goes off home after her parents have found a boy for her, only to return ... Anjali becomes pregnant and Tara helps her deal with the situation ... Paro’s death from asthma causes an abrupt twist in the story since Tara goes to pieces and blames herself for it. Life resumes, but it is not quite the same ... Tara and Anjali go to meet Anjali’s parents, and Tara abruptly drops out ... . This book has a plot that makes you want to read on.